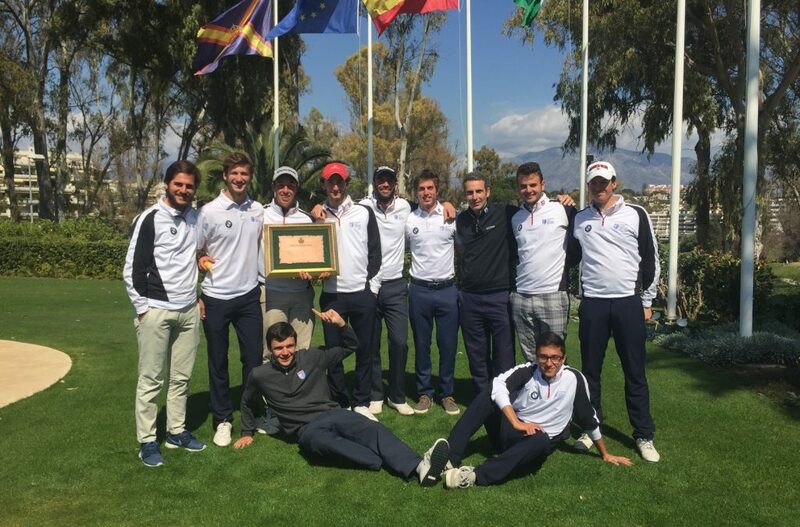 Last weekend, March 12th and 13th, was held at the Club de Golf Guadalmina the first edition of the match between the teams of the Royal Andalusian Golf Federation U-18 and University Golf Program Malaga (UGPM). On Saturday morning the first six matches were played in foursomes mode where UGPM took the lead by 4-2. In the afternoon’s singles matches Andalusia prevailed 7-5, leaving the score in a thrilling tie at 9 points. During Sunday morning foursomes, UGPM deployed again its team play and won a total of 4 points of the 6 in play, winning the competition by a final score of 13-11. From UGPM we want to thank the Royal Andalusian Golf Federation, Guadalmina Golf Club and Mr. Luis Mansilla for the great treatment received throughout the weekend. CONGRATULATIONS TO OUR TEAM BY THIS IMPRESSIVE WIN!! RFGA team: Angel Hidalgo, Gonzalo Leal, Nacho Bridge, Felipe Barrena, Gonzalo Garcia, Pablo Alonso, Sergio Ronchel, Pedro Marin, Gonzalo Noguerol, Zack Karkaletsos, Lukas Pany and Jaime Field. UGPM team: Genaro Ruiz, Pilar Martinez, Victor Pastor, Alberto Ascari, Andrea Gobbato, Juan Muñoz, Christian Asensio, Ignacio Fons and Costantino Peruzzi, Roberto Rivas, Antonio Pimentel (transfer) and Victor Bjorlow (transfer).